Do we really need a new food blog in Albuquerque? I say yes. So here we go. Stop back here often. This is a work in progress. Suggestions are welcome (feedback form at the bottom of this page). I maintain the ABQ Top Ten page on Facebook. You can leave comments here, if you want. 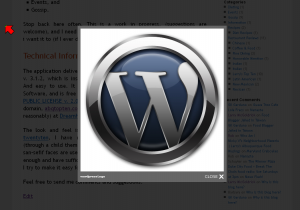 The application delivering these musings is WordPress v. 3.5.1, which is insanely great blogging software. And easy to use. It is distributed as Open Source Software, and is free to use under the GNU GENERAL PUBLIC LICENSE v. 2.0. I have installed it on my own domain, abqtopten.com, which is hosted reliably (and reasonably) at Dreamhost. Nice people. Dreamhost will (and has) automatically upgrade the WordPress installation to the latest version that they have tested. The look and feel is controlled by the installation’s default theme, twentyten, I have modified some important typographical settings (through a child theme)to present typefaces that are easy to read. Black san-sefif faces are used for all posts, comments, and pages, and are large enough and have sufficient leading for these failing old eyes to see clearly. I try to make it easy for the visually challenged to use this site. Most images on pages and posts will display, when clicked on, in a lightbox superimposed over the original page. The original page is grayed out. If there are multiple images on a page, the lightbox frame allows you to cycle through all of them, forward and backward, by clicking the arrows near the left- and right-hand sides. To exit the lightbox display, click outside the box (on the grayed-out part of the page). 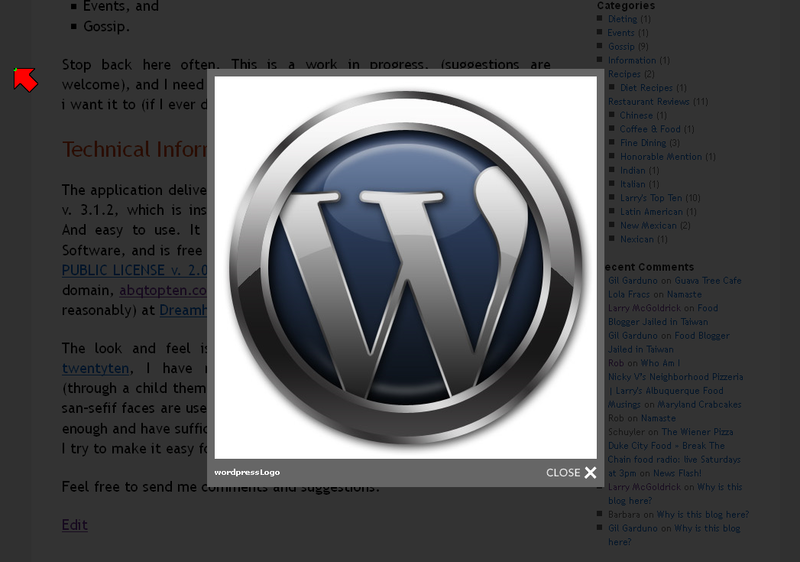 The WordPress lightbox plugin, Lightbox 3, is provided free of charge. Any comment on tipping rates at Albuquerque Restaurants? As a young man I worked in a friend’s restaurant in Los Angeles, and ever since that experience, and reading the excellent memoir “Waiting” I have been a conscientous tipper (even to the point of surreptiously adding to the tip when I think my host under-tipped). I also am discerning in my tipping rates, and will only tip at 20% if the service is excellent. And, I am careful to calculate tips for the amount BEFORE any discounts or coupons are calculated. My wife tells me that she read that, in Albuquerque, a 15% tip is considered an excellent tip. Don’t know where she read it, but it makes me uncomfortable, given my “upbringing”. Still, if that is the practice, I should go along with it. In addition to citing that she read it as guidance since we moved here, she rationalizes that the cost of living is lower here than in California, where we came from 18 years ago. I argue that the PRICES and WAGES are lower here, so 20% is still a good calculation. Anyway, does anyone have any advice. And, no, don’t flame ME!! As they say, I’m just asking, ’cause, really, I just want to KNOW! Have you been to Babaluu’s Cocina Cubana at 3810 Highway 14, Santa fe?? What’s your favorite green restaurant? Do you have a go to spot where you love to eat because they serve locally raised grass fed beef or sustainably harvested seafood? Or is it an organic ice cream parlour that dishes out scoops of acai flavored gelato in compostable dishes? The Nature Conservancy would like you and your readers to nominate the best green restaurants for the Nature’s Plate Award – a people’s choice contest where you get a chance to spotlight eateries that are dedicated to preparing great food while minimizing their impact on our planet. You and your readers have till September 16th to nominate your fave! Please let them know, via your social media or in a blog post, that their vote counts! From October 1st to October 15th the public will have a chance to choose from the semifinalists and one winner from each region will be announced and promoted.Take a look at Last Years Winners. When we support green restaurants, we are also supporting the farmers, ranchers and fishermen/fisherwomen who make such a noble effort to do what’s right for the environment. They deserve to be celebrated. Craving Authentic New Mexican Foods? Albuquerque, N.M. We all have friends or family in other parts of the country who beg, plead and cajole us into sending them their favorite New Mexican foods. Lovers of New Mexico cuisine everywhere can now satisfy their cravings with Chile Hungry. Chile Hungry sends the best New Mexican foods around the country with the click of a button, whether green or red chile, favorite restaurant salsas and sauces or other authentic foods from the Land of Enchantment. Chile Hungry ships green chile, red chile and favorite restaurant brand salsas and sauces around the country, no matter where a customer lives. In the short time Chile Hungry has been fulfilling orders, customers from as far away as Pennsylvania and Hawaii have enjoyed salsas and sauces from Sadie’s, Monroe’s, Bueno Foods, El Pinto and other fine establishments. New products are being added weekly. In the future, the company’s Facebook page and website will offer tips, advice and recipes for using the products to make authentic versions of New Mexico classic foods like enchiladas, tamales, chile rellenos and more. “Got my order earlier than expected. Thank you Chile Hungry. Was able to put green chile on my pizza. My NM roots will be thanking you for days!” says DiDi Allen of Phoenix, Arizona. “ZOMG!! Just what we need, living as expats in Houston!” posts Elizabeth Hanes of Houston, Texas. “Green chiles…we need NM green chiles in stores in Northern Michigan!” writes Michelle Stewart Patrick, Highland Michigan. “I haven’t had chile since August! Green chile chicken enchiladas this week! So very grateful for the connect on the cheap delivery option. Shipping to Hawaii is very costly,” says Dawn Witka, Honolulu, Hawaii. Chile Hungry, a division of KevGo Brands, was founded in 2014 in Albuquerque, New Mexico, as a way to satisfy ex-pat New Mexicans and those who love the authentic foods of New Mexico. KevGo Brands includes Yiayia Maria’s Kitchen, purveyor of traditional authentic Greek desserts based on Mallory’s grandmother’s long-held family recipes. Yiayia Maria’s Kitchen gourmet desserts are all available online at http://www.yiayiamaria.com, or by calling 505-923-3210. Thanks, Kelly. Nice bunch of resources.